As Jury Takes Up Blackwater Massacre in Nisoor Square, a Grieving Iraqi Father Recalls Son’s Death | Democracy Now! Jurors will begin deliberating this week in the murder and manslaughter trial of four former Blackwater operatives involved in the 2007 massacre at Baghdad’s Nisoor Square. The suspects are charged for the deaths of 14 of the 17 Iraqi civilians who died when their Blackwater unit opened fire. The trial featured testimony from witnesses who survived the attack and saw loved ones gunned down. In closing arguments last week, prosecutors said Blackwater guards had shot fleeing civilians and boasted of taking their lives. Nisoor Square is the highest-profile deadly incident involving Blackwater — or any private war contractor — and many Iraqis are watching the upcoming verdict to see how seriously the United States intends to hold its private security companies accountable for their alleged crimes. The first witness to testify in the Blackwater trial was Mohammed Kinani, who broke down in tears when describing how his nine-year-old son, Ali, was shot in the head while riding in the back seat of the family car. Kinani reportedly sobbed so uncontrollably when testifying that Judge Royce Lamberth temporarily dismissed the jury. We air a documentary that tells Mohammad and Ali’s story, “Blackwater’s Youngest Victim,” by the Oscar-nominated filmmakers Jeremy Scahill and Richard Rowley. AMY GOODMAN: Jurors will begin deliberating this week in the murder and manslaughter trial of four former Blackwater operatives allegedly involved in the 2007 massacre at Baghdad’s Nisoor Square. The suspects are charged with the deaths of 14 of the 17 Iraqi civilians who died when their Blackwater unit indiscriminately opened fire. The trial features testimony from witnesses who survived the attack and saw loved ones gunned down. In closing arguments last week, prosecutors said Blackwater guards had shot fleeing civilians and boasted of taking their lives. Nisoor Square is the highest-profile deadly incident involving Blackwater—or any private war contractor. The first witness to testify in the Blackwater trial was a man named Mohammed Kinani. He broke down when describing how his nine-year-old son Ali was shot in the head while riding in the back seat of the family car. Kinani reportedly sobbed so uncontrollably when testifying that Judge Royce Lamberth temporarily dismissed the jury. The next day, one juror said she had been too haunted to sleep, causing the judge to excuse her from service. Well, we turn now to a remarkable documentary that tells Mohammed and Ali Kinani’s story. It’s called Blackwater’s Youngest Victim. The film was created by Big Noise Films and Democracy Now! in association with The Nation magazine and The Nation Institute, shot by Rick Rowley, narrated by Jeremy Scahill. It begins with Mohammed Kinani recalling the day he lost his son. MOHAMMED KINANI: [translated] I’m not just remembering the scene. I’m reliving it as if it were happening now. I will never forget those few minutes. So whatever you ask me, I will answer with absolute clarity. All I could hear from my car were gunshots and the sound of glass shattering and the sound of tires blown out with bullets. I started to scream, “They killed my son! They killed my son!” What can I tell you? It was like the end of days. With cold blood and stone hearts, they continued shooting. JEREMY SCAHILL: Baghdad, September 16, 2007. Shortly before noon, a convoy of four armored vehicles departs the Green Zone, the heavily fortified U.S. base in Iraq. The men inside of the vehicles were elite private soldiers working for Blackwater. Their code name: Raven 23. The men had defied orders from their superiors to remain in the Green Zone and proceeded on to the streets of Baghdad. As they departed, they were again told to return to base. They didn’t. Within minutes, Blackwater Raven 23 would arrive at the congested Baghdad intersection known as Nisoor Square. Fifteen minutes later, at least 17 Iraqi civilians would be dead, more than 20 others wounded, in a shooting that would go down in infamy as Baghdad’s Bloody Sunday. You probably have never heard his name, but you likely know something about how nine-year-old Ali Mohammed Hafedh Kinani died. He was the youngest person killed by Blackwater forces at Nisoor Square. To this day, Blackwater has never faced justice for killing Ali and the other Iraqis that day. But his father Mohammed, who was with Ali in the square, is determined to change that. MOHAMMED KINANI: [translated] I want the truth. I want the truth to be known, and the criminals punished. JEREMY SCAHILL: This is the story of the death of young Ali Kinani, and his father has provided us with the most detailed eyewitness account of the Nisoor Square massacre ever given to a U.S. media outlet. Mohammed Hafedh Abdulrazzaq Kinani and his wife Fatimah lived with their three children in Baghdad. Mohammed ran his family’s auto parts business, and he adored his youngest son Ali, whom his family affectionately called by his kid nickname, Allawi. MOHAMMED KINANI: [translated] He would sleep on my arm. He was nine-and-a-half years old, but still slept on my arm. He had his own room, but he never slept alone. When he turned nine, I told him it was time to stop using my arm as his pillow. I said, “Son, you’re getting older. Go sleep with your brothers, on your bed in your room. Your name is Ali. We used to call you Allawi, but you’ll be a man soon.” So he said, “As you wish, father.” He always said that. So I looked and saw his feet under the door. I called him in. He opened the door and said, “Dad, I’m Allawi, not Ali.” He was telling me that he’s still a child. After that, he kept sleeping on my arm. It was the only pillow he ever had. JEREMY SCAHILL: When U.S. forces rolled into Baghdad in April of 2003, Mohammed proudly took his son to greet the men he called their liberators, the U.S. military. Mohammed was that rare personification of the neoconservative narrative about the U.S. invasion. MOHAMMED KINANI: [translated] The first day the American Army entered Baghdad, I handed out juice and candy in the street, to celebrate our liberation from Saddam. JEREMY SCAHILL: Before September 16th, 2007, Mohammed had never heard of Blackwater. Now he thinks of them and that day every waking moment. He remembers that Ali was not supposed to be in his car that day. Mohammed had just pulled away from his family’s home on his way to pick up his sister Jenan and her children for a visit. Ali came running out of the house. JEREMY SCAHILL: Mohammed and Ali picked up Jenan and her three children and made their way back home. The return journey would bring them through Nisoor Square. When Mohammed found himself in a traffic jam at the square that day, he thought it was a U.S. military checkpoint. Nothing seemed out of the ordinary to him when he saw the armored vehicles block off traffic. MOHAMMED KINANI: [translated] One of the guards gestured towards us with his hands. This gesture means “stop.” So we stopped. I and all the cars in front and behind me stopped. We followed their orders. At that point, I didn’t even know they were Blackwater. I didn’t know it was a security company. I thought it was some sort of American Army unit, or maybe a military police unit. In any case, we followed their orders. JEREMY SCAHILL: As Mohammed and his family waited in the SUV, the man in the car next to them was frantic. “I think someone was shot in that car in front of you,” he told Mohammed. It was then Mohammed watched in horror as Blackwater gunners, for no apparent reason, blew up a white Kia sedan in front of his eyes. Inside, Mohammed would later learn, were a young Iraqi medical student and his mother. MOHAMMED KINANI: [translated] There was absolutely no shooting or any sign of danger for us or Blackwater. No one was in the slightest danger. Suddenly, in the flash of a second, they started shooting in all directions. And it wasn’t warning shots. They were shooting as if they were fighting in the field. By the time they stopped shooting, the car looked like a sieve. This is the only way to describe it, because it was truly riddled with bullets. They finished with the first car and turned their guns on us. It turned into the apocalypse. JEREMY SCAHILL: As chaos and blood flooded the square, Mohammed remembers the fate of one man in particular who tried to flee the Blackwater gunmen. MOHAMMED KINANI: [translated] Everyone was trying to escape. Whoever wasn’t shot dead in their car just wanted to escape somehow. When one man tried to run, they shot him. He dropped dead on the spot. He was on the ground bleeding, and they were shooting, and they were shooting nonstop. They shot like they were trying to kill everyone they could see. He sank into his own blood. And every minute, they would go back and shoot him again, and I could see his body shake with every bullet. He was dead, but his body shook with the bullets. He would shoot at someone else and then go back to shooting at this dead man. The man is dead in a pool of blood. Why would you keep shooting him? JEREMY SCAHILL: As Mohammed sat in his SUV with his nine-year-old son Ali, his sister Jenan and her three children, he realized that, for them, attempting to escape was not an option. As the shooting intensified, Mohammed yelled for the kids to get down. He and Jenan did the same. MOHAMMED KINANI: [translated] Bullets were coming from the right and the left. My younger sister was trying to cover me with her body. So I pulled out of her grip and covered her with my body to protect her. I have pictures that show the headrest of my sister’s seat is full of bullet holes. It was horrific, extremely terrifying. I still wake up from sleep, startled. Why? I ask. Why would they do this? We were civilians sitting in our cars. Most of the cars had families in them. So why did this happen? I kept hearing boom, boom, boom in my car. Bullets were flying everywhere. It was horrific, horrific. I don’t know. I don’t know how to describe it. After they had killed everyone in sight, my sister and I kept still. I had her rest her head on my lap, and my body was on top of her. We would sneak to peek from under the dashboard. They continued shooting here and there, killing this and that one. Then it cleared. Nothing was moving on the street. Only the Blackwater men were moving. Then, they drove off. JEREMY SCAHILL: It seemed to Mohammed like a miracle had blessed his car. “We’re alive,” he thought. As the Blackwater forces retreated, Mohammed told Jenan he was going to check on the man who had been repeatedly shot by Blackwater. It was then Mohammed’s world crumbled. MOHAMMED KINANI: [translated] When I got out of the car, my nephew said, “Uncle, Allawi is dead.” My sister started screaming, and I turned to look at Ali. I turned and saw that his window was broken. It was shot. I looked at him, and his head was resting at the side of the door. I opened the door to see if he was OK. I opened the door, and he started falling out. I stood there in shock, watching him as the door opened and his brain fell to the ground between my feet. I looked at his brain on the ground, and I pushed him back into the car. I told my sister that they had blown his brains out. I started to scream, “They killed my son! They killed my son!” I was turning and screaming. People were standing on the roof of a nearby building, saying, “Get out! Get out!” But I was in another world. They killed my son, and I was looking at his brain. I didn’t know what to do. I didn’t know what to do. I reached through the window to check his heart, and it was beating. I told my sister, who said, “Let’s rush him to the hospital. Maybe he still can make it.” But I knew. His brain was on the ground. He’s gone. I turned the car, which had no water, no tires, and I spun it around. I drove towards Yarmouk Hospital. JEREMY SCAHILL: At the hospital, Mohammed was told that because of Ali’s severe head injuries, an ambulance would need to rush him across town to a neurological hospital. MOHAMMED KINANI: [translated] Riding in the ambulance, I was completely destroyed. My son was dying in front of my eyes. He was suffering. His arms were shaking and almost pulled out the IVs. So I held his hands still. He died. What can I say? My son. Up to the night before his death, my son never slept alone. JEREMY SCAHILL: That night, Mohammed returned home, and his father greeted him at the door. What can I say? I don’t know what to say. I was speechless. JEREMY SCAHILL: Mohammed later returned to Nisoor Square to gather what pieces he could find of Ali’s skull and brain. The family then laid Ali to rest in the Shiite holy city of Najaf. MOHAMMED KINANI: [translated] My son died innocent, at an age when there are no strings attached. He flew up to heaven like a white dove. JEREMY SCAHILL: After Ali died, the U.S. Embassy in Baghdad contacted Mohammed, offering his family a $10,000 condolence payment, making clear it was not a remedy for what happened and not a substitute for any potential legal action against the shooters. Initially, Mohammed refused the money, but the embassy pursued his family, urging them to take it. They eventually did, but with one condition: that half the money be donated to the family of a U.S. soldier killed in Iraq. Mohammed’s wife Fatimah delivered the gift to the U.S. Embassy. MOHAMMED KINANI: [translated] This is a gift from Ali’s family to whichever family you choose, the family of any soldier who lost his life for the sake of Iraq. I want to give it as a gift. I know it is insignificant, but it is an emotional and moral gesture from us to them. ERIK PRINCE: No, sir. I disagree with that. I think there’s been times when guys are using defensive force to protect themselves, to protect the package. They’re trying to get away from danger. There could be ricochets. There are traffic accidents, yes. This is war. You know. JEREMY SCAHILL: Mohammed watched those hearings live and was outraged. MOHAMMED KINANI: [translated] I wish they would ask the head of Blackwater, did he think that this child was a threat to his company? This giant company with all the biggest weapons, guns and planes—was this boy a threat to them? Despite Prince’s brazen denials, the thought of suing Blackwater didn’t cross Mohammed’s mind. He didn’t want anyone’s money. He readily cooperated with the U.S. military and federal investigators, and he believed that justice would be done in America. Then, he says, Blackwater stepped in. In February 2008, ABC News did a brief story about Mohammed. The day the story was posted online, Blackwater’s attorney threatened to take legal action against the network, accusing ABC of defamation. What outraged Mohammed was that Blackwater denied its forces killed Ali, claiming instead that he was killed by a stray bullet, possibly fired by the U.S. military an hour after Blackwater personnel had departed the scene. Blackwater claimed Ali was hit by a warning shot that ricocheted and killed him. It was not even possible, the Blackwater lawyer claimed, that Blackwater was responsible. Shortly after that, Mohammed said an Iraqi attorney approached him. But he wasn’t just any lawyer. Ja’afar al Moussawy was the chief prosecutor of the Supreme Iraqi Criminal Tribunal, which prosecuted Saddam Hussein. He was the Iraqi lawyer. Mohammed agreed to meet with Moussawy and Blackwater’s regional manager. He says they offered him $20,000. JEREMY SCAHILL: Mohammed then confronted the Blackwater manager about the company’s claim that the U.S. military, not Blackwater, may have killed Ali. JEREMY SCAHILL: Mohammed threw the pen and paper at the Blackwater manager and left the meeting. MOHAMMED KINANI: [translated] So I had no choice but to go the legal route and take things to court, to get justice, to bring closure for the victims’ families, and to deter other criminals from committing the same crime. JEREMY SCAHILL: On September 15th, 2009, the night before the second anniversary of Ali’s death, Mohammed Kinani sued Blackwater in its home state of North Carolina, along with Blackwater’s owner Erik Prince and the six men he believes are responsible for Ali’s death. PAUL DICKINSON: The U.S. Army was over there fighting for people just like Mohammed. And he’s come here with a heart full of belief in the justice system in the United States. GARY MAUNEY: This is not a case about national security at all. JEREMY SCAHILL: Dickinson’s colleague, Gary Mauney. GARY MAUNEY: These were people who were in a public square in Iraq, much like the main intersection in Charlotte, North Carolina, is called Trade and Tryon. It’s the primary intersection in the city where we live. It’s the equivalent place for where this occurred. The Blackwater employees were in that square, and they opened fire. 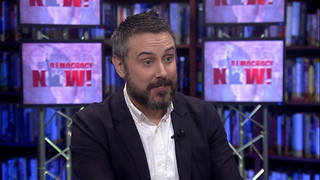 JEREMY SCAHILL: Dickinson and Mauney have gathered volumes of evidence and interviewed scores of eyewitnesses. But perhaps their greatest piece of evidence comes from one of the men they’re suing. Jeremy Ridgeway, a turret gunner on the Raven 23 team that day, pled guilty to killing an unarmed civilian. Mauney points to Ridgeway’s own sworn statements. GARY MAUNEY: What Mr. Ridgeway has said is that Raven 23 was not supposed to be there, and that they—what they did was not justified by any provocation whatsoever. This is not some lawyer making a hyperbolic argument. This is Mr. Ridgeway, who was there, who was working for Blackwater at the time. JEREMY SCAHILL: In addition to Jeremy Ridgeway’s statement, Mauney and Dickinson plan to introduce statements made by other Blackwater guards in the square that day, who said they were horrified at what their colleagues did, saying that they shot at civilians for nothing and for no reason. With the Justice Department’s criminal case against Blackwater very much up in the air, Mohammed Kinani could well be the one man left standing between Blackwater and total impunity for the Nisoor Square massacre. GARY MAUNEY: This is the last case that’s standing in the United States right now. This is it. This is it. ALI KINANI: [translated] I am Allawi. I am Allawi. AMY GOODMAN: Blackwater’s Youngest Victim by the Oscar-nominated filmmakers Jeremy Scahill and Rick Rowley. Jurors begin deliberations this week in the manslaughter and [murder] trial of four former Blackwater operatives involved in the September 16, 2007, massacre at Baghdad’s Nisoor Square. Mohammed Kinani was the first to testify in the trial. His nine-year-old son Ali was killed in the square that day. This is Democracy Now!, democracynow.org, The War and Peace Report. Back in a minute.